Delta-shaped anastomosis is usually applied for an intracorporeal gastrogastrostomy in totally laparoscopic pylorus-preserving gastrectomy (TLPPG). However, the remnant stomach is slightly twisted around the anastomosis because it connects in side-to-side fashion. 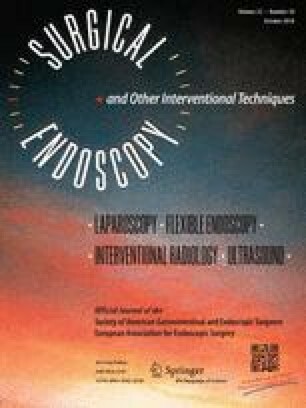 To realize an intracorporeal end-to-end gastrogastrostomy using an endoscopic linear stapler, we invented a novel method including a unique anastomotic technique. In this new approach, we first made small gastrotomies at the greater and lesser curvatures of the transected antrum and then pierced it using an endoscopic linear stapler. After the pierced antrum and the proximal remnant stomach were mechanically connected, the gastrotomies and stapling lines were transected using an endoscopic linear stapler, creating an intracorporeal end-to-end gastrogastrostomy. We have named this technique the “piercing method” because piercing the stomach is essential to its implementation. Between October 2015 and June 2017, 26 patients who had clinically early gastric cancer at the middle third of the stomach without clinical evidence of lymph node metastasis underwent TLPPG involving the novel method. The 26 patients successfully underwent an intracorporeal mechanical end-to-end gastrogastrostomy by the piercing method. The median operation time of the 26 patients was 272 min (range 209–357 min). With the exception of one gastric stasis, no problems associated with the piercing method were encountered during and after surgery. The piercing method can safely create an intracorporeal mechanical end-to-end gastrogastrostomy in TLPPG. Piercing the stomach using an endoscopic linear stapler is a new technique for gastrointestinal anastomosis. This method should be considered if the surgical aim is creation of an intracorporeal end-to-end gastrogastrostomy in TLPPG. The online version of this article ( https://doi.org/10.1007/s00464-018-6237-6) contains supplementary material, which is available to authorized users. Manabu Ohashi, Naoki Hiki, Satoshi Ida, Koshi Kumagai, Souya Nunobe, and Takeshi Sano have no conflicts of interest or financial ties to disclose.